The CLAW Artists Guild presents THE MONTH OF AUGUST with all your favorite August News updates! Starting with our new creation “CLAW FEST” a mini comic book convention craft festival with booths and artist alley tables and local artists selling their cool merchandise or “Merch.” Check this site and our facebook page for a slow trickle of news and updates about this free and fun event in Tacoma at the Feast Art Center (1402 South 11th St.)! Monster Painting Thrift Shop Art show update! All your old favorites and some select new thrift shop paintings with monsters skillfully inserted into the landscape are up and hanging right now in the Red Elm Cafe in Tacoma’s Chilltop/Hilltop neighborhood. You should go, grab a waffle dog and enjoy the show all August! August CLAW art game happening at Kings Books on the 4th Wednesday of every month and open to the public! What will we be doing for August? Good Question! Let me see if I have anything written in my notes… Fabric Painting maybe? Let’s find out for sure together! 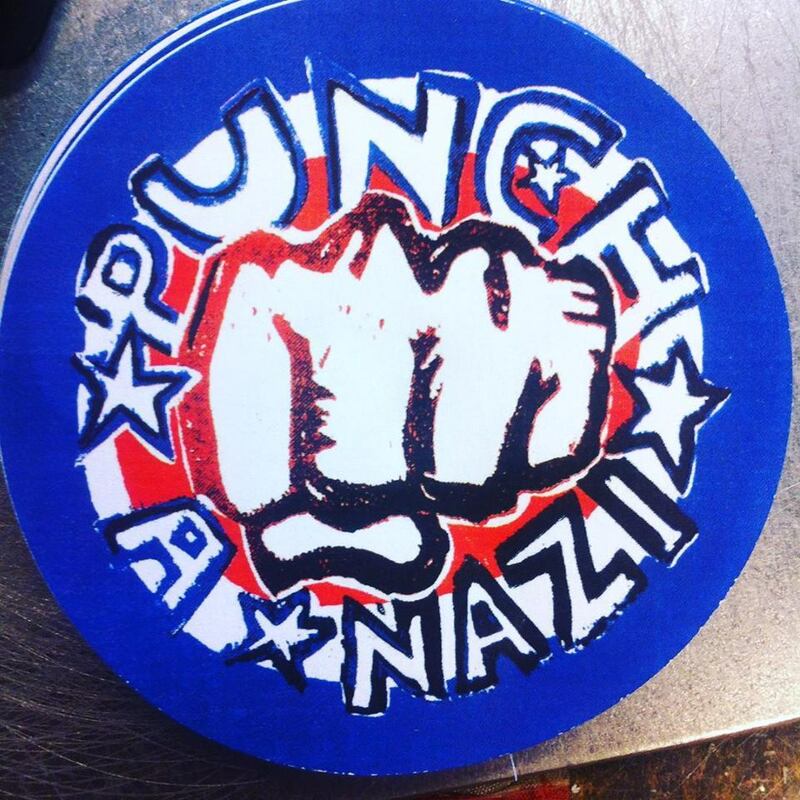 You might have read in the Tacoma News Tribune about Tacoma’s nazi tattoo shop and patriot front neo-nazi poster attack on Downtown businesses including the Rainbow Oasis Center, Well underground political cartoonist, RR Anderson, author of The Tacomic has crafted a campaign style button out of his sold-out “Punch-a-Nazi” block carving print. On Sale soon at Tinkertopia! ART news around the sound..
City Arts Magazine did a pretty deep dive into the Tacoma art scene and worth a read. The Spirit and Substance of a changing Tacoma. 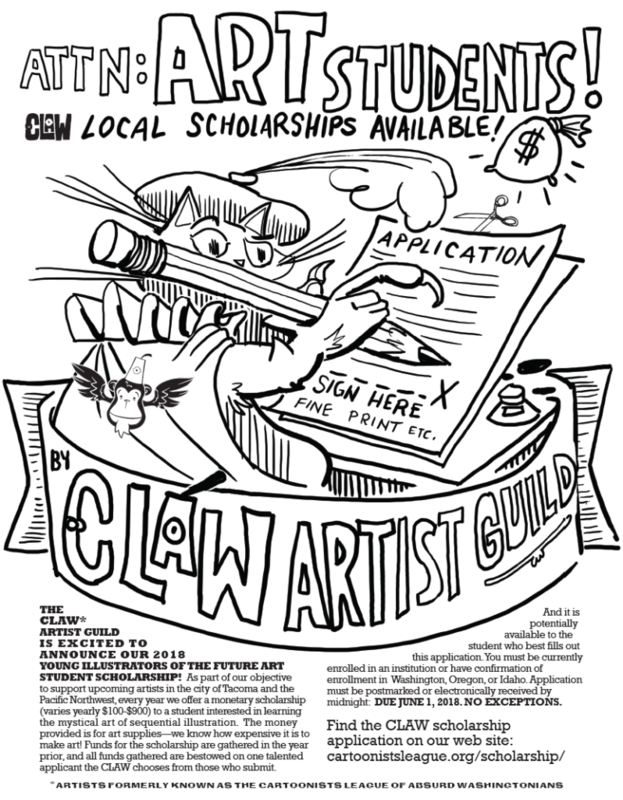 BREAKING: CLAW’S 2018 YOUNG ILLUSTRATOR OF THE FUTURE ART SCHOLARSHIP application deadline extended till JUNE 1st! CHECK our SCHOLARSHIP page for portfolio submission details! CLAW Instagram account: GET REAL TIME photo updates from CLAW activities now on instagram here @theclawartistguild PLEASE follow us! Wayzgoose Letterpress Report: HUGE SUCCESS! Big Thanks to Printmaking CZAR Anique Zimmer and CLAW President Jennevieve Schlemmer for manning the CLAW booth activity! Come on down to #tacomawayzgoose at King’s Books today and find our booth for a fabric print! Bring a shirt or bag, or pick from our fabric swatches and bring home a print of Sal the Serpent here or his friend Mr Skull. Look for the flying monkey! Zine/Comic Workshop Report: ANOTHER HUGE SUCCESS! Big Thanks to Zine CZAR Anique Zimmer and CLAW President Jennevieve Schlemmer for making this Pierce County Reads event happen! CLAW Monsters in Thriftshop Art Show STATUS UPDATE: paintings are currently on display at… Soaring Crane Bodywork, 2520 N. Adams, Tacoma. It’s in the Proctor district, across the street from the library. (More specifically, across the street from the statue.) UP NEXT: Traveling thrift art show will be on exhibit at the RED ELM CAFE approx mid July through August. We will discuss and plan at meeting next week! There’s lots of wall space for new paintings! HELLO SEEKERS! Tinkertopia, official art store of the CLAW still has plenty of room in its summer camp program! Did you know they just won “MOST INNOVATIVE RECYCLER OF THE YEAR” award from the Washington State Recycler Association? It’s a Tinker FACT! Two days of CLAW events are coming up at this final weekend of April! We’ll be teaching a comics workshop at the Parkland/Spanaway Library for Pierce County Reads next Saturday the 28th from 6-8 PM. For anyone who wants to dip their toes into making their own comics, zines, or graphic novels, this will be a primer on basic art practice and visual storytelling. Check out the event page and RSVP here! A large portion will be devoted to open drawing time, so we encourage attendees to bring their latest inspiration, ideas, and projects. There will be a Q&A, plus a show & tell showcasing some great examples of independently produced comics and zines. We hope to see you there! And of course, the time has come again for Tacoma Wayzgoose at King’s Books. 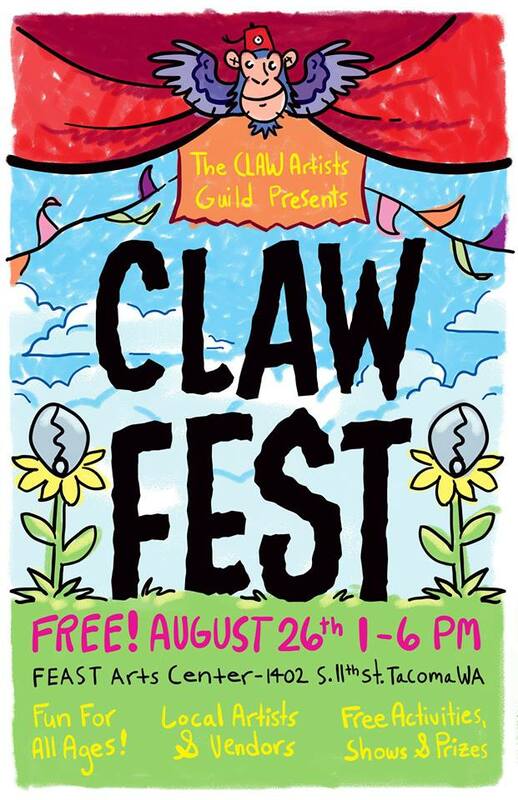 No steamroll printing for us this year, but our booth inside King’s Books will have CLAW and member merchandise, plus a new free activity this year. Bring any light-colored blank bags, shirts, handkerchiefs of any cloth (no nylon!) for a free linoleum stamp for fabrics! No blank things to bring? Tinkertopia has you covered with a cool batch of fabric swatches to choose from. Check out our Instagram to see one of the two stamp designs we’ll be using (new one coming soon! ).